The Grand Mosque was a physical representation of the Late Sheikh Zayed bin Sultan Al Nahyan's lifelong vision to build a site of great symbolic significance on Islam and the country's cultural and national values. Construction began in 1996 by artisans from several different countries with intricate designs inspired by Moorish and Mughal architecture. The majestic edifice incorporates the use of natural materials such as white marbles, crystals, gold and ceramics. The prayer halls were initially opened in 2007. Father Zayed's resting place is located on the grounds. The mosque and its courtyard can accommodate 40,000 worshippers, including 7,000 in the main prayer hall. There are a total of 4 minarets and 82 white marble domes representing different Islamic styles. The mosque has approximately 1,000 columns outside which are clad with marble panels and semi-precious stones. 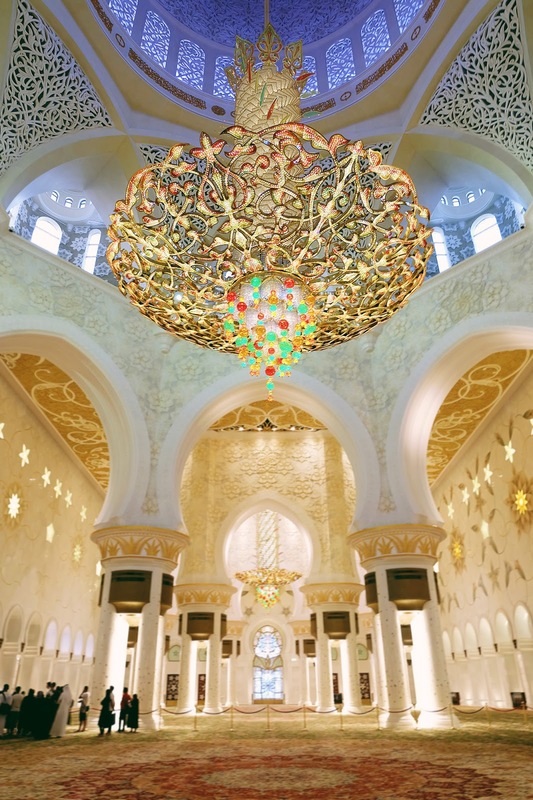 The main prayer hall features the world's largest chandelier imported from Germany and adorned with thousands of Swarovski crystals. The floor of the hall is covered with more than 5,000 square meters of handmade carpet from Iran, which makes it the the longest carpet in the world. The mosque uses an extraordinary lighting in the evening that follows the phases of the moon - gradually becomes lighter at full moon and turning bluer as the moon wanes. There 99 names of Allah inscribed on the Qibla wall in traditional Kufi calligraphy. The mosque is open for all nationalities and religions. Visitors can walk around the main courtyard except Friday mornings and prayer times. Everyone is advised to dress respectfully. In any case, women will be provided with a headscarf and abaya for free, while men in shorts will be given a kandura or dishdash. You'll need to take your shoes off on entry to the mosque. Photography is permitted inside but avoid taking pictures of the locals and women. I've been here a few times and it is undoubtedly always a pleasure to visit. I suggest you go during the day and in the evening for two different experiences. You should see how the mosque is set against the dark evening sky. IT IS STUNNING! The mosque is surrounded by garden areas, towering palm trees and water pools. By walking around every area of this architectural treasure, you can see how much thought and attention to details have gone into its formation. Sheikh Zayed Grand Mosque is 'a vision that would last a lifetime', to describe it in a few words. It should definitely be your top place to see on your first time in Abu Dhabi. To join a guided tour, visit the official website of Sheikh Zayed Grand Mosque. Entrance is free of charge. Show a valid ID to collect your headscarf and abaya.